From the Department of Biomedical Sciences, University of Modena and Reggio Emilia, Modena, Italy and aChelsea and Westminster Hospital, London, UK. Effects of HIV infection on mitochondria: priming for drug toxicity? This review is intended to provide understanding of the function of mitochondria, the advantages and disadvantages of available techniques for assessing mitochondrial function and quantity and to discuss the main clinical toxicities thought to be associated with mitochondrial dysfunction and how they may be managed or their prevalence reduced. Mitochondria are the key organelles in energy production in all human cells except erythrocytes. Energy, in the form of ATP, is produced through the highly efficient oxidative phosphorylation pathway. Additionally, mitochondria perform a range of other biological functions and carry a number of factors involved in cell apoptosis. Both HIV infection and antiretroviral nucleoside analogues (nucleoside reverse transcriptase inhibitors; NRTI) are known to affect mitochondrial DNA content and other aspects of mitochondrial function. A number of important clinical events occurring in individuals with HIV infection and on antiretroviral therapy have been linked to mitochondrial injury and dysfunction. In vitro studies have demonstrated that NRTI may differ in their effects on mitochondria and may affect mitochondria in different cell lines in different ways. This is likely to influence the clinical syndromes associated with toxicity to these agents. Dideoxy-NRTI have the greatest affinity for mitochondrial DNA polymerase-g, the enzyme responsible for mitochondrial DNA replication, whereas other nucleoside analogues may influence mitochondrial function also through other mechanisms. These differences may be important in choosing techniques to evaluate the impact of antiretroviral agents on mitochondria. The mitochondrion, from the Greek mito, thread and khóndrion, granule, was identified at the end of the nineteenth century. It was subsequently established that the mitochondrion was responsible for the majority of cellular energy production (in form of ATP) through the process of oxidative phosphorylation, driven by mitochondrial membrane potential (chemiosmosis). Subsequently, other biochemical and biological contributions of mitochondria to eukaryotic cellular function have been described (summarized in Table 1). More recently, we have expanded our understanding of the genetic basis of human diseases associated with mitochondrial DNA (mtDNA) mutations and the mechanism(s) that regulate the numbers and mass of these organelles, as well as the duplication of the DNA that these organelles contain. The number, mass and morphology of mitochondria is partially controlled by fusion and fission events regulated by a variety of protein messengers. Intracellular mechanisms exist to regulate the distribution of mitochondria during the cell cycle and cell division, their morphology, the replication and the inheritance of mtDNA into daughter cells. The morphology of mitochondria shows variability across different cell types. Cells of hemopoietic origin (such as lymphocytes, monocytes, or platelets) typically display cigar-like organelles, while in muscle cells mitochondria are seen in rows between sarcolemma, in sperm cells they form spirals in the tail region, in fibroblasts and preadipocytes mitochondria form a reticulum. They may fuse or increase in size to form giant mitochondria or megamitochondria, and tend to locate near the structures where energy is required. Additionally, mitochondrial appearance and number in a tissue may change in response to changing tissue needs, most evident in cold adaptation or under the situation of high metabolic activity. Conversely, the number of mitochondria can be reduced by pyknosis, ballooning, or autophagolysosome formation. Recent data underline the importance of mitochondria morphology and its correlation with the organelle's functionality, as the pleomorphicity of such organelle is probably linked to cell cycle stage or to the metabolic state of the organelle itself. The mitochondrial matrix contains circular DNA of 16 569 base pairs, in punctate structures called 'nucleoids'. Each nucleoid may contain several copies of mtDNA. Replication of mtDNA is performed by DNA polymerase-g, a nuclear DNA (nDNA) encoded enzyme. In humans, several factors are required for transcription initiation, including the human mitochondrial promoter, h-mtRNA polymerase, and the DNA binding mitochondrial transcription factors, h-mtTF-A and -B. Additional regulatory factors are hypothesized. Little is known of the factors that regulate the production and neogenesis of mitochondria. Studies are complicated by the fact that their stability varies considerably from tissue to tissue (their half-life in liver is suggested to be 3-5 days, in brain 30 days ), and that their components have different turnover rates. More is known about the mitochondrial changes provoked by agents which cause functional impairment or dysruption. When altered by a stimulus that does not provoke the necrotic death of the cell, mitochondria generate or amplify signals that lead to programmed cell death/apoptosis. Mitochondrial apoptosis, mitoptosis, occurs following stimuli provided by reactive oxygen species or tumour necrosis factor (TNF)-a and can result in cellular apoptosis because of the loss of mitochondrial membrane potential (DYm), and the release of apoptogenic proteins such as cytochrome c or the apoptosis-inducing factor. Mitochondria also contain antiapoptotic proteins whose role is yet to be clarified. Non-fatal insults that damage mtDNA can be repaired by a proficient base excision repair of oxidative DNA damage. However, mtDNA damage can impair the capacity of the organelle to synthesize crucial enzymes of the oxidative phosphorylation, so provoking a greater dependence on lactate generating cytosolic metabolism of glucose and a reduced capacity to clear H+ formed from the hydrolysis of ATP. Mitochondrial function can be assessed in several ways, by using a large variety of techniques that include assays of enzyme function from isolated organelles, bioenergetic studies of the mitochondrial membrane potential (DYm) and assays evaluating release of specific factors after standardized stimuli. These assays all require consideration of the quantity of mitochondrial mass present in the sample. Defects in mitochondrial enzymes may be encoded for both by errors in mtDNA but also in nDNA. Methods for purification and extraction of intact mitochondria from cells have enabled the developement of a wide range of biochemical assays to evaluate the enzymes contained in the organelle and their activity. For example, to measure the functionality of different complexes (I-IV) of the respiratory chain, as well as the capability of the organelle to consume oxygen under different conditions. These assays have been recently used to investigate the presence of alterations in muscle mitochondria from HIV-positive lipodystrophic patients. The assays on isolated organelles provide important information, but, in order to obtain enough biological material from muscle or fat tissues, open surgical procedures under local anaesthesia are often required. Red blood cells do not contain mitochondria hence large volume blood draws are required to obtain a sufficient number of organelles from platelets and white blood cells, necessary to perform biochemical measurements. However, in these established assays mitochondria are not studied in their natural environment, i.e., the cell. Bioenergetics involves the evaluation of mitochondrial membrane potential (DYm) to analyse mitochondria functionality in intact cells. The energy released by the mitochondrial respiratory chain during oxidation reactions is stored as an electrochemical gradient consisting of two components: mitochondrial membrane potential of about -200 mV, and a proton gradient of about 1 unit. This energy gradient drives the synthesis of ATP. To analyse the mechanisms which regulate changes in membrane potential of organelles with a negative interior, several membrane-permeable, lipophilic cations have been used, due to their property to accumulate into such organelles. A variety of systems have been developed to measure mitochondrial membrane potential (DYm). These assays have some possible disadvantages including: the time required to achieve equilibrium distribution of a mitochondrial membrane probe; degree of passive (unspecific) binding of probes to a membrane component in a non-(DYm) dependent manner, such as in the case of nonyl acridine orange (NAO), or rhodamine 123 (Rh123), which has several energy-independent binding sites; toxic effects of probes on mitochondrial functional integrity; sampling procedures; interference from light scattering changes and from absorption changes of mitochondrial components; requirement of large amounts of biological materials. More recently, by using the lipophilic cation 5,5,6,6‚-tetrachloro-1,1,3,3‚-tetraethylbenzimidazolyl carbocyanine iodide (JC-1), a cytofluorimetric technique was developed to detect variations in (DYm), at the single cell level, which has been validated at the single organelle level. JC-1 has advantages over rhodamines and other carbocyanines as it is capable of entering selectively into the mitochondria of living cells, and has reversible colour changes from green to orange as (DYm) increases. Both colours can be detected using the filters commonly mounted in flow cytometers or confocal microscopes. JC-1 is now considered the gold standard for analysis of (DYm), and has been used for several studies on HIV infection. Mitochondria contain cardiolipin (CL), a unique phospholipid with dimeric structure, that is located exclusively in the inner membrane of these organelles, and is involved in the modulation of a number of cellular processes including the activation of mitochondrial enzymes and hence production of energy by oxidative phosphorylation. The distribution of CL between the inner and outer leaflet of mitochondrial internal membrane is crucial for the activity of several enzymes of the respiratory chain, and can be modified in different circumstances, as well as by different damages . Flow cytometry allows the analysis of CL intramitochondrial distribution, taking advantage of the spectral characteristics of NAO. Indeed, it is possible to quantify the amount of CL present on the two leaflets of the mitochondrial internal membrane, and obtain information on the functional status of the organelles. CL distribution was first studied in lymphocytes from HIV-positive children with lipodystrophy, and, along with other mitochondria parameters, it was found to be normal. Mitochondrial mass, related to the number of organelles present in a given cell, can be quantified using particular low concentrations of NAO. This parameter can be also investigated with a newly developed fluorescent molecule, Mitotracker green. Mitochondrial mass is a crucial parameter that has to be taken into account to ensure that the cells under investigation are not unspecifically damaged, and thus that the functional changes are not due to trivial damages that reduce the number of organelles in the population under investigation. Each mitochondrion contains several copies of circular mtDNA, which are more susceptible to mutation than nDNA due to limitations in the DNA repair system, higher local concentration of oxygen free radicals, and to the absence of protective histones. Cells and tissues vary in the number of mitochondria they contain, and thus in mtDNA content, depending on the metabolic activity of the cell. Mitochondria concentrations are high in hepatocytes and brain cells (several hundreds), low in lymphocytes (about 10-20) and absent in erythrocytes. Assays may consider either the quantity of mtDNA or the quality (i.e., amount or type of mutations present). These assays generally are technically simpler than functional assays. However, quantification of mtDNA content during NRTI therapy essentially addresses only whether the therapy is affecting the function of DNA polymerase-g, and as such may be most relevant to therapy with dideoxy-NRTI, the agents which have the greatest affinity for this enzyme. As aspects of mitochondrial enzyme function may also be altered by NRTI (see below), the impact of these agents on the mitochondria will be missed if only mtDNA content is assessed. MtDNA can be studied with several readily available techniques including sequencing, long PCR, and analysis of deletions. Semi-quantitative analysis can be performed by Southern blot assays that compare the amount of a specific mitochondrial gene to that of a nuclear gene, after gel electrophoresis. Competitive quantitative PCR has allowed the precise quantification of mtDNA content in several cells, including peripheral blood lymphocytes from children with lipodystrophy or in adipocytes from HIV-positive adults with or without lipodystrophy. Recently developed 'real-time PCR' has provided an additional method for quantifying mtDNA. Data obtained with this technique showed that mtDNAin buffy coat preparations from patients with HIV infection is lower than that in uninfected individuals, and in those taking dideoxy-NRTI who had'symptomatic hyperlactatemia' mitochondrial DNA levels were further significantly decreased. Discontinuing therapy led to some increase in themtDNA : nDNA ratio. However, another study in peripheral blood leukocytes failed to demonstrate a correlation between mtDNA depletion or deletions and drug consumption, even in patients with moderate or severe lipoatrophy or lactic acidosis. Other data indicate that subcutaneous fat but not peripheral blood mononuclear cells (PBMC) from HIV-positive individuals contain less mtDNA. A statistically significant decrease in mtDNA copies per cell has been found in placenta and cord blood from HIV-positive women on NRTI; in adipocytes from HIV-positive patients treated with stavudine or zidovudine such drugs are associated with mtDNA depletion and proliferation of mitochondria. Using such as novel approach, mtDNA content can now be precisely measured in almost all human cells, but, because of the variable number of organelles present in different cell types, careful attention has to be paid to the homogeneity of the biological material under investigation. For example, if cells derived from peripheral blood using standard isolation methods (such as density centrifugation on Ficoll-Hypaque or similar) are analysed, platelet contamination must be accounted for. In peripheral blood and buffy coat samples platelets are considerably over-represented compared to leukocytes. Platelets contain mitochondria with fully functioning mtDNA so if platelets are not accurately removed and mtDNA is measured in blood-derived heterogeneous cell populations, changes in mtDNA content could be due to several causes, including variations in platelet quantity and their mitochondrial content, which maybe affected not only by antiretroviral therapy but also by sample processing or storage. Platelet removal is readily performed and cells of interest (e.g., lymphocytes, monocytes) can be purified by magnetic sorting. Additionally, as injury to mitochondria by antiretroviral agents may be tissue specific (due to variable activation of NRTI and tissue-specific heteroplasmy) the measurement of changes in mtDNA in one tissue or cell line may not be accurately reflective of events which are occurring in other tissues. A wide range of adverse events occurring in persons with HIV infection receiving NRTI-based therapy have been suggested to be related to diminished mitochondrial function. The development programs of zidovudine, didanosine, zalcitabine, and stavudine all required dose de-escalations due to toxicities thought to be related to drug impact on mitochondria. Due to limitations in measurement technology, clinical studies of NRTI, while collecting adverse event data, have not specifically evaluated mitochondrial toxicity in a systematic way. Lactic acidosis is the event that establishes proof that clinically important mitochondria toxicity occurs in persons receiving NRTI although causation is notnecessarily established by this observation. For lactic acidosis to occur the mitochondrial oxidative phosphorylation system, which normally removes H+ generated by the hydrolysis of ATP, must be dysfunctional. Lactic acidosis in the critical care setting has a range of causes and these are not always reliably excluded in reports of persons with HIV who develop lactic acidosis. Not surprising, lactic acidosis has also been reported in persons with HIV not currently receiving antiretroviral therapy. Other NRTI-associated adverse events where the weight of evidence favours mitochondrial injury include peripheral neuropathy, myopathy, and hepatic steatosis. However, multiple other etiologies for these adverse events exist and should be routinely sought in persons presenting with these effects. Other adverse effects observed during antiretroviral therapy that may represent manifestations of, or be contributed to, by mitochondrial toxicity include hypogonadism, pancreatitis, diabetes mellitus, dysphagia, nausea and vomiting, proximal renal tubular dysfunction, hair loss, dry skin, paronychia, encephalopathy and dementia, depression and psychosis, anemia, and neutropenia and peripheral fat atrophy. Concern has also been raised regarding the possibility of mitochondrial toxicity arising in infants after in utero exposure to NRTI. In a retrospective studyfrom France, eight cases (0.46%) of suspected mitochondrial dysfunction, including two deaths, were observed across 1754 mother-child pairs exposed to zidovudine with or without lamivudine. Subsequently a further eight cases have been identified. However, in a large database that included 353 deaths in more than 20 000 children with and without antiretroviral drug exposure who were born to HIV-infected women followed prospectively in several large cohorts in the USA, no deaths similar to those in France were identified. More recently, an extremely high incidence of hyperlactatemia in infants after in utero NRTI (mainly zidovudine + lamivudine) exposure have been reported adding to previous reports suggesting mitochondrial dysfunction may be common in infants exposed to nucleoside analogs in utero, possibly due to differential effects of NRTI during ontogeny. Additionally, reports of a high rate of nDNA mutation (genotoxicity) have been reported in children exposed to zidovudine in utero, underlining that DNA damage may not be localized to the mitochondria. Although a risk of adverse effects related to perinatal prophylaxis may exist, data continue to demonstrate thebenefit of NRTI-based prophylaxis in the prevention of transmission of HIV from mother to child. Thus, current treatment guidelines strongly favour thecontinued use of NRTI in these circumstances. Familial or inherited mitochondrial diseases are well recognized in medicine, particularly in paediatrics, neurology, and hepatology. Mutation in either mtDNA or nDNA may lead to disorders of mitochondrial function. Familial mitochondrial diseases relate to inherited or spontaneous mutations, deletions, or rearrangements of genes involved in mitochondrial formation or function. In some cases, these mutations are not compatible with life. However, the majority of patients with defects of mtDNA have a mixture of both affected and unaffected (wild-type) mtDNA, intracellular heteroplasmy. Diminished mitochondrial function results in a wide range of clinical diseases. The presentation is varied, even in individuals with the same genotype. In general, the impact of mitochondrial dysfunction becomes apparent in the most metabolically active tissues. Thus, manifestations commonly involve the brain, including the retina; the peripheral nervous system; cardiac and other muscles; and the endocrine, renal, gastrointestinal, hematologic, and hepatic systems. Only in Madelung's syndrome has a mitochondrial disorder been associated with changes in fat distribution. Drugs that may impact the mitochondria also tend to lead to adverse effects in the most metabolically active tissues with the brain (e.g., valproate, lead, alcohol), other nerves (aminoglycosides, alcohol), heart (anthracyclines, amiodarone, alcohol), and liver (valproate, aspirin, alcohol) all involved and lactic acidosis is occasionally seen (phenformin, metformin, alcohol). For most familial disorders, depletion of mtDNA or mitochondrial dysfunction has been demonstrated in the tissues involved. The functional mitochondrial capacity is generally < 80% of normal before clinical manifestations become apparent and may be < 5%. This is usually assessed by evaluating the proportion of mutant versus functional mtDNA present. In the HIV setting this assessment may not be appropriate as, while some drugs (mainly the dideoxy-NRTI) may predominately affect mtDNA content (by inhibition of DNA polymerase-g) others (most notably zidovudine) may effect mitochondrial enzymes or other nuclear gene expression. Functional assays may therefore be more appropriate. In comparing the manifestations of familial mitochondrial disease with clinical events related to NRTI mitochondrial toxicity, most striking is the absence of central nervous system (CNS) manifestations amongst the NRTI effects. This is despite NRTI being known to penetrate the CNS at effective concentrations.The reason for this is not currently clear. It may relate to the fact that familial disease is present throughout ontogeny whereas NRTI are generally given at atime when these tissues are mature. This may explain the observation of possible CNS mitochondrial toxicity in French children exposed in utero to zidovudine or zidovudine + lamivudine. Other involved tissues demonstrate considerable overlap between familial disorders and NRTI-associated adverse effects. Myopathy and cardiomyopathywith zidovudine, peripheral neuropathy with zalcitabine, didanosine and stavudine, retinal degeneration in children with didanosine, proximal renal tubulardysfunction (Fanconi-like syndrome) with adefovir, and lactic acidosis and hepatic steatosis with all NRTI (especially dideoxy-NRTI). In general, no management for familial mitochondrial diseases is available beyond supportive therapy, although gene therapy and the use of peptide nucleic acids are being investigated. Anecdotal claims of benefit have been made for a range of supplements including carnitine, ubiquinone (co-enzyme Q-10), riboflavin, thiamine, ascorbate, tocopherol and succinate, similar to reports in NRTI-related lactic acidosis. However, reliable evidence for these supplement is lacking. Numerous studies have observed that patients with untreated HIV infection have diminished mtDNA relative to age-matched uninfected individuals. Muscle and nerve biopsies from untreated individuals presenting with HIV-associated myopathy or distal symmetrical peripheral neuropathy (DSP) may have low mtDNA, abnormalities in mitochondrial ultrastructure or respiratory chain abnormalities. These changes are similar to those reported with NRTI therapy in vitro, animal and human nerve and muscle cells. Declines in mtDNA in adipose tissue of untreated individuals have also been described. Changes in the mtDNA : nDNA ratio in PBMC (or buffy coat) was proportionally more affected when comparing HIV negative controls to HIV infected individuals (a 44% reduction) relative to the addition of antiretrovirals (a further 24% decline). Thus, reductions in mtDNA occur with HIV infection alone and these changes pre-date the use of NRTI therapy or symptoms. Indeed, mtDNA in PBMC may rise following the initiation of effective therapy. However, changes in mtDNA content or mitochondria ultrastructure in NRTI-treated individuals, with or without clinical disease are generally greater than in untreated persons. These data raise the possibility that HIV directly, or cytokines released in response to HIV infection or immune reconstitution may injure mitochondria, potentially making them more vulnerable to the effects of NRTI. Several HIV gene products, most notably TAT and viral protein R (vpr), have been demonstrated in vitro - all in animal models - to decrease or damage mitochondria and cause clinical disease. For example, expression of TAT may lead to cardiomyopathy with mitochondrial destruction in mice. HIV vpr directly affects the mitochondrial permeability transition pore and may trigger cell apoptosis through a mitochondrial pathway independent of caspase. HIV-1 protease may also process procaspase to cause mitochondrial release of cytochrome c triggering apoptosis. Cytokines are of particular interest as muscle, nerve or fat cells may not be infectable by HIV. TNF-a, a well known pro-apoptotic cytokine that uses mitochondria as targets has been implicated in increasing liver injury from alcohol and in particular contributing to steatohepatitis, a condition reflective of diminished mitochondrial beta-oxidation of fatty acids. TNF-a and interferon-g also inhibit mitochondrial respiration in smooth muscle and other cells. Interferon is a pro-apoptotic cytokine whose effects are mediated through mitochondrial cytochrome c release and impaired mitochondrial DNA transcription. TNF-a and interferon-a are elevated in untreated HIV infection [34,85] but may decline with therapy although subsets of CD8 lymphocytes highly productive of TNF-a may persist. Several studies have suggested associations between elevations TNF-a or soluble TNF-a receptor type II and dyslipidemia, insulin resistance and/or fat atrophy, a condition associated with some degree of mtDNA reduction in fat cells. More recently, interferon-a has also been linked with this syndrome . Taken together, these data suggest that the mitochondrial changes observed in a range of tissues from persons with HIV may represent the consequences ofcytokines produced during HIV infection and immune reconstitution, and that changes in mitochondrial appearance and mtDNA content may to someextent predate the introduction of NRTI therapy and/or be a consequence of mitochondria being a pathway through which these cytokines act. Thus,individuals with HIV infection may be of increased risk of mitochondrial toxicity from NRTI than may be expected from studies in uninfected cell lines animals or human volunteers. A number of different individual genetic characteristics may influence cell behaviour and drug exposure, which then impact on the mitochondria as a final common pathway. Relevant areas in this regard include cytokines such as TNF-a, and cellular pumps such the multidrug resistance (MDR)-1. In addition, the cell cycle is known to influence expression of thymidine kinase type 1 and thus may impact the activation of thymidine analogues. Structural aspects of drugs which influence individual drug affinity for cellular enzymes (such as thymidine kinase types 1 and 2, DNA polymerase-g and other human polymerases, mitochondrial enzymes such as adenylate kinase, citric synthetase) are also relevant to the relative risks of accumulation of toxic (as well as achieving effective) drug exposures in individual cells or tissues. Although TNF levels may decline initially, after several months of highly active antiretroviral therapy (HAART) TNF homeostasis is dysregulated, with accumulation of TNF-a producing cells. The expression of TNF-a is linked with insulin resistance and lipoatrophy. Presence of the –238 polymorphism (TNFA-A allele), a genetic polymorphism which increases TNF production, is independently associated with an increased risk of lipoatrophy. The role of other cytokines in other putative mitochondrial diseases in persons with HIV infection has not been extensively investigated. MDR-1 gene has a functional polymorphism in exon 26 (C3435T) that is significantly correlated with expression levels and function, and affects the absorption and tissue concentrations of numerous substrates of MDR-1, including protease inhibitors . Recently, it has been suggested that this polymorphism could predict immune recovery after initiation of antiretroviral treatment, indicating that that P-glycoprotein (encoded by MDR-1) has an important role in admittance of antiretroviral drugs to restricted compartments in vivo. These data have been partially confirmed by other studies. Other genes of interest include those involved in lipid metabolism and cell differentiation or linked to apoptosis, such as CD95/Fas or CD178/Fas ligand. The list of candidate genes is clearly considerably longer. Lactic acidosis with or without hepatic microsteatosis is the most serious presentation of NRTI-associated mitochondrial dysfunction. During a developmentstudy for the fluorinated thymidine analogue fialuridine for HBV infection, seven out of 15 treated patients developed severe hepatotoxicity and lactic acidosis, with three patients showing milder changes. Subsequently, five patients died and two survived after liver transplantation. Pancreatitis, neuropathy, and myopathy often accompanied the syndrome. Liver histology showed macro- and microvesicular steatosis and abnormal mitochondria. Lactic acidosis has been reported in persons receiving both single- and dual-NRTI regimens including combinations of zidovudine or stavudine with didanosine, zalcitabine, or lamivudine. The incidence of lactic acidosis is in the range of four to five per 1000 patient years of therapy. The risk of lactic acidosis may vary with demographics, being somewhat more common in women, the obese and those with hepatitis co-infection and by nucleoside combination, several cohorts suggesting stavudine + didanosine being associated with the greatest relative risk. Healthy individuals have circulating levels of lactate but maintain normal blood pH. Lactate levels may rise during periods of increased energy needs (such as exercise, hypermetabolic states), hypoxic or hypoperfused states (cardiac, respiratory disease, haemoglobin disorders), when cellular lactate release isincreased (such as hyperinsulinaemic states) or when the key tissues involved in clearance (liver, kidneys) dysfunction [113,114]. However, raised lactate(hyperlactataemia) does not inevitably lead to acidosis. Indeed, recent surveys of individuals on NRTI therapy indicate hyperlactataemia to be a relativelycommon event occurring episodically in 10-20% of individuals per annum whereas acidosis remains infrequent at less than 0.4% per treatment year. These data suggest that lactate metabolism may exist in a spectrum from normal through mild to moderate elevation or 'compensated' hyperlactataemia tosevere and 'decompensated' hyperlactataemia and acidosis . Recent data quantifying mtDNA : nDNA ratios in the PBMC of persons receiving NRTI therapy found that this ratio was diminished often for many months prior to the development of symptomatic hyperlactatemia. Only a 'weak correlation'between lactate levels and mtDNA : nDNA was observed. Drug withdrawal led to a recovery of mtDNA and a fall in lactate levels. Decompensation may, therefore, require additional triggers such as respiratory or other intercurrent infection, alcohol bingeing, or introduction of additional drugs. During the development of zalcitabine, didanosine, and stavudine, phase I/II dose-finding studies revealed a dose-dependent distal symmetrical peripheralneuropathy (PN) as being the major treatment-limiting adverse effect. The NRTI vidarabine was the first drug of this class found to cause PN during clinical trials in persons with hepatitis B. PN has not been consistentlyattributed to zidovudine, lamivudine or abacavir. The clinical presentation of NRTI-associated neuropathy is similar to that of HIV-associated DSP, although NRTI-associated DSP may be more likely to be painful and have an abrupt onset and rapid progression. The electrophysiological changes are also similar to those seen in DSP, suggesting axonopathy. Histology in both conditions reveals mitochondrial changes. There are several theories for the mechanism of this complication, the weight of evidence pointing to mitochondrial toxicity. Using an in vitro model of nerve cells, zalcitabine and didanosine have been shown to reduce mtDNA, leading to destruction of mitochondria and an increase in intracellular lactate levels. A second study confirmed this finding but surprisingly found pharmacologically relevant concentrations of stavudine as well as zidovudine and lamivudine had no impact on neurite regeneration or mtDNA, suggesting stavudine nerve toxicity may involve additional or different mechanisms. Nerve biopsies from patients with NRTI-associated neuropathy have shown abnormal mitochondria with enlarged size, excessive vacuolization, electron-dense concentric inclusions and degenerative myelin structures. Abnormal mitochondria represented the majority (55% versus 9% in controls) of nerve cell mitochondria in biopsies from persons with zalcitabine-related neuropathy and mtDNA was reduced by as much as 80% compared with the controls. This degree of mtDNA depletion is consistent with loss of functional mtDNA observed in familial mitochondrial disorders and hence is consistent with causation. Mitochondrial changes are also found in nerves of untreated persons presenting with DSP, hence neuropathy in persons on therapy may in some cases represent an unmasking or exacerbation of a pre-existent mitochondrial neuropathy. Depleted levels of acetyl-l-carnitine have been found in patients with PN on zalcitabine, stavudine, or didanosine therapy, compared with those on the samedrug without PN. Acetyl-l-carnitine may increase the rate of peripheral nerve regeneration following injury by promoting nerve growth factor release. In the short term, depletion of acetyl-l-carnitine disrupts mitochondrial metabolism and causes a toxic accumulation of fatty acids. This provides a further mechanism for NRTI neurotoxicity, which, combined with other risk factors, may lead to clinically significant PN in a given individual. PN in many HIV patients on therapy may have a multifactorial origin; drugs may themselves cause PN but may also unmask a pre-existent subclinical DSP.Hence, the likelihood of neuropathy, its severity, and the degree to which the patient recovers following NRTI withdrawal, may depends on both pre-existing risk factors, NRTI choice and dose. Myopathy was the first clinical toxicity associated with antiretroviral NRTI thought to be mitochondria related. Reduced doses, particularly of zidovudine, have resulted in it now being observed infrequently. A myopathy related to HIV infection with overlapping clinical and histological features, including mitochondrial changes, also exists. Skeletal muscle is most commonly affected, leading to proximal weakness, fatigue, muscle pain and muscle wasting, particularly in large muscles, often with a raised creatinine kinase. However, more serious but rare manifestations include rhabdomyolysis and hypertrophic cardiomyopathy. Additionally, myopathy may accompany or be a harbinger of lactic acidosis. Skeletal myopathy has been predominantly reported with zidovudine. As with neuropathy, specific changes in muscle mitochondria have been observed in clinical biopsy samples and in animal or in vitro models. Effects have been demonstrated in both skeletal and cardiac muscle. Histologic features that are said by some authors to be distinguishing include ragged-red fibres and abnormal mitochondria with paracrystalline inclusions, although mitochondrial abnormalities have also been reported in therapy-naive persons with HIV-related myopathy. Tissue-specificity studies with zidovudine have demonstrated that thisdrug has greater impact on muscle cells, compared with kidney or liver cells, and may involve inhibition of succinate transport or cytochrome oxidase activity, reduction in carnitine, oxidative damage to mitochondria and destruction of myotubes rather than reduction in mtDNA. Thus, myopathy with zidovudine may relate to this agent's impact on mitochondrial enzyme systems rather than on DNA polymerase-g. Other studies have found that zidovudine may affect a range of mitochondrial functions including strongly inhibiting the ADP/ATP antiport, in a competitive manner, and adenylate kinase. This difference in the mechanism of toxicity with zidovudine relative to dideoxy-NRTI probably relates to the observation that its cyto- and mitochondrialtoxicity are mediated through its intermediate metabolite zidovudine monophosphate rather than the triphosphate metabolites responsible for the toxicity (and activity) of other NRTI. This has important implications when assessing ways in which drug impact on mitochondria is measured becausestandard measures of mtDNA content are likely to underestimate the effects of zidovudine on mitochondrial function. The aetiology of fat distribution, lipid and glucose handling abnormalities remains obscure. Contributions from both protease inhibitor and nucleoside analogues as well as host and disease factors are supported by epidemiological and prospective clinical evidence. The syndrome has been observed in individuals naive to protease inhibitors and naive to nucleoside analogues suggesting these agents are not necessary for the changes. Non-drug associations observed in cross-sectional studies, such as age, genetic characteristics, changes in CD4 cell counts and viral load with therapy, and alterations in hormonal and cytokine profiles during therapy suggest a multifactorial pathogenesis or specific individual predispositions. The mechanism by which nucleoside analogs contribute to the syndrome is not known. There is evidence to support mitochondrial toxicity as the mechanism of lipoatrophy. However, some data have accumulated to refute this hypothesis. Fat biopsy studies demonstrate reductions in mtDNA in samples from lipoatrophic patients. However, samples from persons with lipoatrophy in some cases have normal levels of mtDNA and some control samples (including from HIV-negative individuals) show diminished mtDNA. In these biopsy studies, while mitochondrial changes in areas of fat loss and fat hypertrophy are similar (reduced mtDNA, increased mitochondrial protein), TNF-a levels are more explanatory of the clinical differences, being elevated in areas of atrophy but not hypertrophy. Clinical function studies indicate that both fat oxidation and glucose oxidation are normal or potentially increased in persons with metabolic disturbances on protease inhibitor + NRTI based regimens. Results of culturing fat cells (adipocytes and preadipocytes) for up to 8 weeks with either zidovudine or stavudine did not show effects at concentrations normally achieved during treatment. When protease inhibitors and NRTI were given together to adipocyte cultures a marked synergy was observed on a range of adipocyte functions, most notably increased fat release (lipolysis) but not changes in mitochondria. This cellular dysfunction is consistent with radioisotope studies in patients. The manifestations of NRTI-associated mitochondrial toxicity are generally at least partially reversible upon discontinuation of the causative agent(s). However, choosing agents that appear to have a low risk of these toxicities and avoiding use of combinations with overlapping mitochondrial toxicities may the best means of limiting the incidence of these problems. Additionally, agents that may increase the intracellular exposure of some nucleoside analogues, such as hydroxyurea, ribavirin and possibly mycophenolic acid, should be used with caution over prolonged periods. Maintaining a high index of suspicion for mitochondrial toxicities, particularly lactic acidosis, remains key to the diagnosis of this condition, particularly as the presentation is often non-specific. There remains a need for the development of cheap, simple, non-invasive diagnostic tests for mitochondrial toxicity that could potentially become part of the routine screening of persons on NRTI therapy. As discussed above, assays of mtDNA content do not appear to fulfil these needs - functional assays are required. The severity of the toxicity, the extent of cellular injury or tissue damage may, in part, influence the extent of reversibility of mitochondrial toxicity. Mitochondrial toxicities often recur following the reintroduction of the same or similar agents. Whilst some evidence from the pre-HAART era suggests that stavudine or zalcitabine-related PN may be managed by dose reduction, this cannot be recommended in HAART regimens. The continuation of treatment despite toxicity is likely to lead to worsening and potentially less reversibility. Additionally, the occurrence of one mitochondrial toxicity may be the harbinger of the development of another more serious event such as lactic acidosis. Substitution of one NA for another may be feasible in cases of neuropathy or myopathy and possibly persistent hyperlacatemia. Replacement of thymidineanalogues - or specifically stavudine with abacavir - has lead to gradual improvement in limb fat mass in several studies, potentially due to a reduction in peripheral adipocyte or preadipocyte mitochondrial toxicity. Abacavir, lamivudine, emtricitabine and tenofovir have not been associated with significant mitochondrial toxicity based on in vitro and clinical experience and may therefore represent the best replacement drugs. However, a recent in vitro combination culture experiment with NRTI in HepG2 cells indicated that addition of lamivudine contributed to cytotoxictity beyond that observed with zidovudine alone. For lactic acidosis, progressive or severe symptoms, the NRTI (therefore the whole regimen) should be stopped promptly. Even in these circumstances lactic acidosis carries considerable mortality. Rechallenge after lactic acidosis should be with caution as recurrence has been reported in one patient immediately after the introduction of an alternative nucleoside analogue regimen. Thus, these patients may be best managed, when feasible, with either a long (say 3-6 months) therapy interruption to enable more complete resolution or with a NRTI-sparing regimen such as dual protease inhibitors + non-nucleoside reverse transcriptase inhibitors. Knowledge of the biochemical and enzymatic pathways disrupted by mitochondrial toxins has led to suggestions for agents which may prevent, reduce the risk of, or assist in the management of mitochondrial dysfunction. Evidence for these agents is largely anecdotal and dosing schedules have not been established. Additionally, only a few of these agents have been studied, in vitro or in vivo, specifically for NRTI-related mitochondrial toxicity. The majority of these agents represent food supplements or vitamins (Table 2). A further problem with these preparations is that their pharmacology is often poorly understood, toxicology studies may be limited, and bioavailability may vary markedly between available brands. Before recommending routinely, consideration of the potential for drug interactions with antiretroviral agents is needed. Agents that have been tested with anecdotal 'benefit' in vitro include vitamins C and E for zidovudine-induced myopathy and acetyl-l-carnitine for myopathy and neuropathy. Carnitine has also been demonstrated to have a protective role in models of myopathy in vitro and in a small randomized study was demonstrated to reduce oxidative stress and maintainmitochondrial membrane potential, leading to reduced apoptosis, in CD4 and CD8 cells of individuals treated with zidovudine and didanosine. In lactic acidosis, the administration of riboflavin and/or ubiquinone has coincided with clinical improvement. The use of a combination of riboflavin, ubiquinone, l-carnitine, and thiamine has been suggested for persons presenting with NRTI-associated lactic acidosis. However, what is really needed is an international collaborative study to accumulate a meaningful experience with this problem. Similar combinations of supplements are being use by persons with or concerned about fat redistribution. Again, specific studies are needed particularly for individuals where drug substitution is a high risk option. Available evidence suggests that a number of important clinical events in individuals with HIV infection are related to mitochondrial dysfunction. Severalfactors may contribute to the development of these events and the tissue(s) in which the event occurs. Some individuals are likely to have important geneticpredispositions for mitochondrial disease, which may be unmasked by the presence of HIV infection or the introduction of NRTI antiretroviral drugs. HIV infection per se is associated with reduction in mtDNA content and changes in mitochondrial morphology and function, which in some cases leads to clinical events such as myopathy or distal symmetrical neuropathy. NRTI antiretroviral agents may impact mtDNA content and function through a number of different mechanisms and have been demonstrated to be causative of a number of clinical toxicities. A range of other clinical events occurring in individuals with HIV infection, and particularly those on therapy, have also been suggested to be associated with mitochondrial dysfunction. 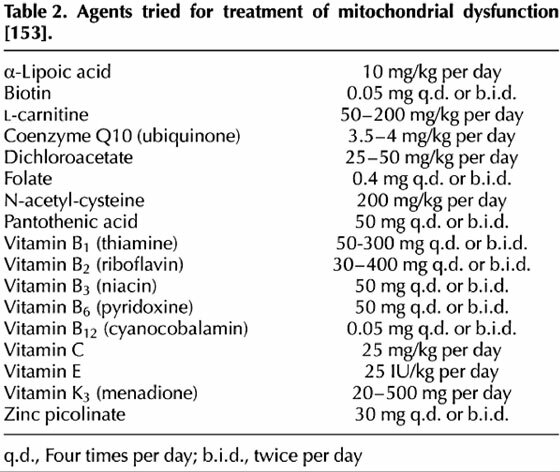 Newer nucleoside and nucleotides agents such as lamivudine, abacavir, and tenofovir appear in vitro and in limited clinical data to be less likely to inhibit mitochondrial DNA polymerase-Œ≥ or other mitochondrial functions and appear to be associated with a lower risk of events thought to be related to mitochondrial toxicity. Avoidance of mitochondrial toxicity is the better option. While drug choice plays an important role in the avoidance of mitochondrial toxicity, for many individuals treatment options are limited. Simple, non-invasive tests for mitochondrial function are not routinely available at present, and assays of mtDNA content in blood cells may miss key aspects of mitochondrial function, require careful sample handling and may not reflect events occurring in other tissues. There remains a need for the development of rapid, cheap and clinically applicable assays that would enable the prediction of increased likelihood of mitochondrial events. Additionally, international collaborative studies are required to look at interventions that may be used to enable individuals to remain on specific drug therapies but with a diminished risk of mitochondrial toxicity events.